作者: Alessandra Bonanomi on 26 October , 2017. Since the age of four, Mija (Ahn Seo-hyun) has raised Okja, a massive animal and her best friend, alongside her grandfather (Byun Hee-bong) in a forest of South Korea. However, Okja was not hers to have. An American corporation, Mirando, simply loaned those big pigs to farmers across the world to promote their company image. In fact, the company’s main purpose was to create the perfect breed of pig for meat. Eventually, Okja’s stay in Korea ends and she must be sent back to where she came from. Mija travels across the world to save her friend with the help of members of the A.L.F. (Animal Liberation Front) team; leading to a happy ending. 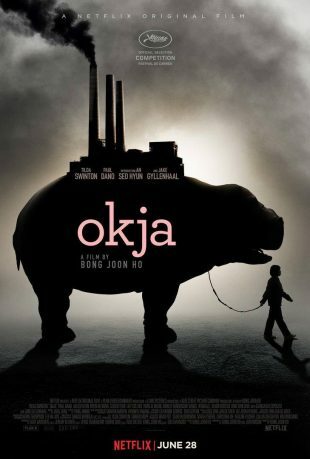 Irrespective of some criticisms such as poor acting by Jake Gyllenhaal (Dr. Johnny Wilcox) or the unconvincing possibility that a young Korean girl raised in the countryside would be able to reach New York without being able to speak any English, Okja is a movie about the meat industry, and is suitable to be viewed across all ages. Far from being visually gory as the PETA’s (People for the Ethical Treatment of Animals) videos, the movie approaches a young audience, helping them think of what is behind the meat that is consumed every day. Okja is a 2017 action-adventure film, directed by Bong Joon-ho, and competed for the Palme d’Or in the main competition section at the 2017 Cannes Film Festival. Released on Netflix on June 2017, the movie was greatly appreciated by members of the audience. After visiting a slaughterhouse, director Bong Joon-ho turned to veganism for two months even though it is not easy to be vegan or vegetarian in South Korea. According to the Organization for Economic Cooperation and Development (OECD), in 2016, Korea’s per capita meat consumption was recorded at 24.3 kg of pork, 15.4 kg of chicken, and 11.6 kg of beef; a total larger than China and Japan by 4 to 16 kg. The average Japanese person ate 14.9 kg of pork, 13.6 kg of chicken, and 7 kg of beef while the average Chinese person consumed 32 kg of pork, 11.4 kg of chicken, and 3.7 kg of beef. As the world’s most populous country, China consumes a lot of food. And with a growing population and a growing middle class, the demand for meat in China is expected to continue rising. China now consumes 28% of the world’s meat, including half of its pork, according to The Guardian. In order to meet the demand for meat, Chinese companies have been buying farms in the United States and Australia to provide enough cattle feed for the country’s dairy and beef industries. Moreover, China produces, eats, and processes more seafood than anyone else on Earth, contributing one-third of the global supply. In the past, poverty and religious beliefs acted as deterrents to the consumption of meat in many Asian countries. Religions such as Jainism, Hinduism, and Buddhism are based on the principle of nonviolence that is strictly related to vegetarianism. And it is now widely known that Islam does not allow the consumption of pork. But even in India, where around the 30% of the population is vegetarian due to such religious beliefs, meat consumption is growing. Studies show urbanization has been causing a rise in the demand for meat products. As more people move to the cities, they adapt to a pattern of increased consumption of meat. The 2006 report Livestock’s Long Shadow, released by the Food and Agriculture Organization (FAO) of the United Nations, states that “the livestock sector is a major stressor on many ecosystems and on the planet as a whole. Globally it is one of the largest sources of greenhouse gases and one of the leading causal factors in the loss of biodiversity, while in developed and emerging countries it is perhaps the leading source of water pollution.” Based on this report, global meat consumption may double between years 2000 to 2050, largely as the result of the increase in world population and increase in per capita meat consumption. The rise in meat-eating has direct environmental implications such as water consumption (meat production requires a large amount of water: the production of 1kg of meat requires between 5,000 and 20,000 liters of water the production of 1kg of wheat requires only 500 to 4,000 liters of water), effects on aquatic ecosystems, deforestation (many rainforests have been cleared or burned down in the last 40 years, mostly for cattle pastures), grassland destruction (environments on which wild animals had thrived were trampled and replanted with monoculture grass for large-scale cattle grazing), animal waste, methane emissions, energy consumption, effects on antibiotic resistance (livestock production has been associated with increased antibiotic resistance in bacteria), and lifestyle diseases (especially heart disease). It is clear that intensive livestock-rearing is not sustainable and is affecting the environment by contributing to global climate change. Urbanization and the growth of the middle class in large countries such as China and India are only aggravating the situation. Often, meat is seen as a symbol of high status and wealth in developing countries; something to show off. But of course, creating widespread consciousness about this topic is not easy. Especially since the majority of us have become used to seeing pigs, cows, and chicken as meat instead of the animals that they are. Some of those who live in cities may never see such animals alive in their lifetime. Thus, perceptions of the relation between man, nature, and animal are completely skewed. In order to change the unsustainable habits related to meat consumption, the promotion of animals as simply food should be stopped. Animals, too, are living beings in their own right. This is the central message behind Bong Joon-ho’s Okja. The director was able to create a product suitable for even children to watch and not be traumatized by the content. Okja is then open to a young audience in teaching how to respect animals. For these reasons, it is important to open more discussions about meat in schools, where children are eager to learn—and Okja may be a good way to facilitate the talks.